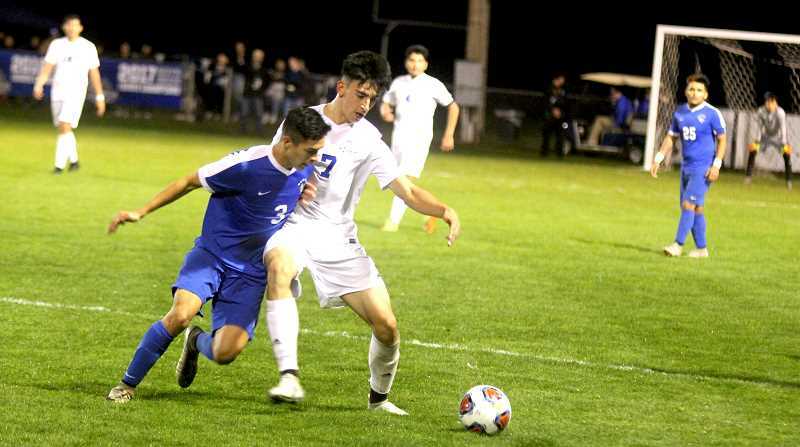 White Buffalos boys soccer cannot get by former 5A state champions Woodburn, loses 6-0. 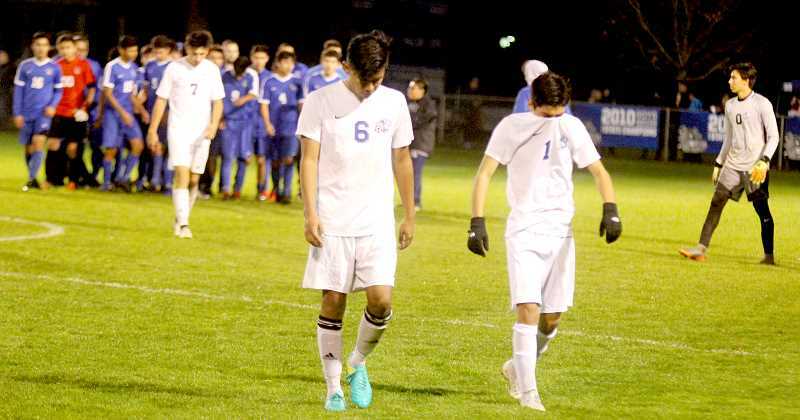 The Madras White Buffalo soccer program lost to Woodburn 6-0 in a 4A state semifinals playoff game Nov. 6. Madras made it to the semifinals match by beating both McLoughlin and Newport. 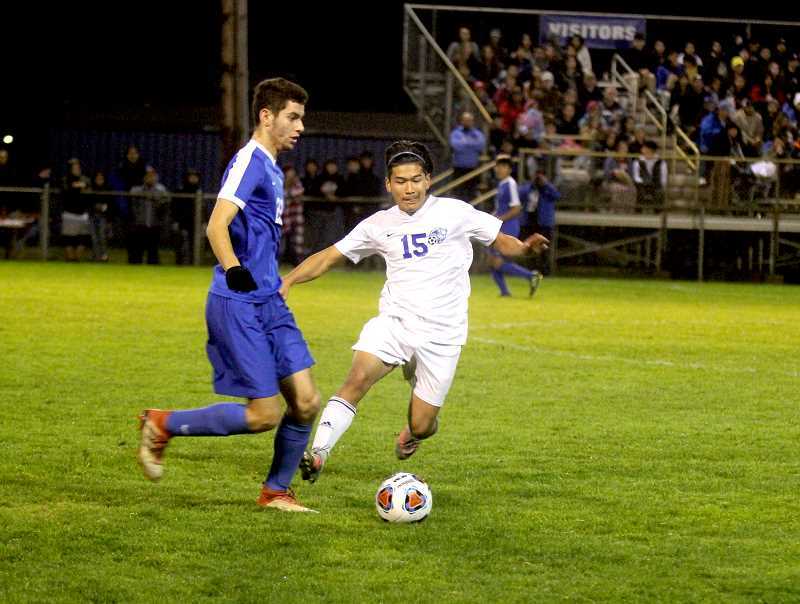 The White Buffalos beat McLoughlin 3-1 on Oct. 30 and used a high frenetic pace to beat Newport 2-1 on Nov. 3. On the other side of the 4A state bracket, North Marion beat Phoenix 1-0 in a semifinals match and the Huskies, who were second in the Tri-Valley league behind Madras, played Woodburn in the championship match at Liberty High School Nov. 10. Woodburn beat North Marion 2-0 to win another state championship. North Marion came into the 4A state playoffs as the 13 seed. They beat the No. 4 ranked La Grand team 2-1 on Oct. 30 to make it to the quarterfinals game. They also beat No. 12 ranked Seaside 1-0 Nov. 3 and upset No. 1 Phoenix to reach the finals. Woodburn came into the playoffs ranked No. 3 and won two consecutive state championships at the 5A levels in 2016 and 2017. From 2010 to 2018 Woodburn has won five 5A state championships and now one 4A state championship. The Bulldogs were dropped from 5A to 4A this year during the OSAA reclassification this fall. They finished the 4A regular season with a 13-1 record. 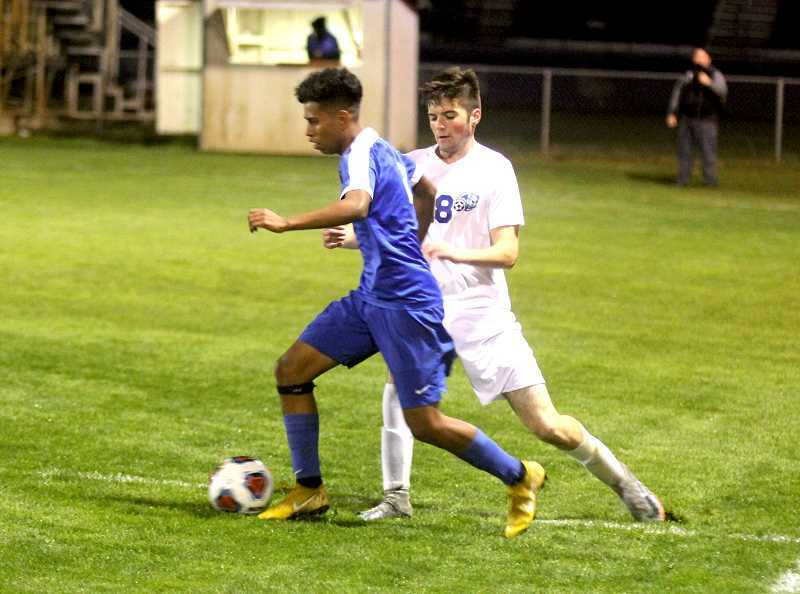 In the Madras and Woodburn semifinals match, The Bulldogs were able to spread the field and use precise passing to control the ball and keep it away from the Buffs. Madras came out with a fast pace, but the passing of Woodburn shifted the positions of the field. Five minutes into the game, a free kick around 30 feet out, on the left side of the Madras goal was awarded to Woodburn. The Bulldogs kick the ball high in the air and Jesus Rodriguez leaped in the air and headed the ball in for Woodburn. At the 26 minutes mark, Madras was called for another penalty in the exact same spot they scored the first goal of the game. The Bulldogs lined up the shot and ran the exact same play, but this time the White Buffalos were ready and headed the ball away from the goal. 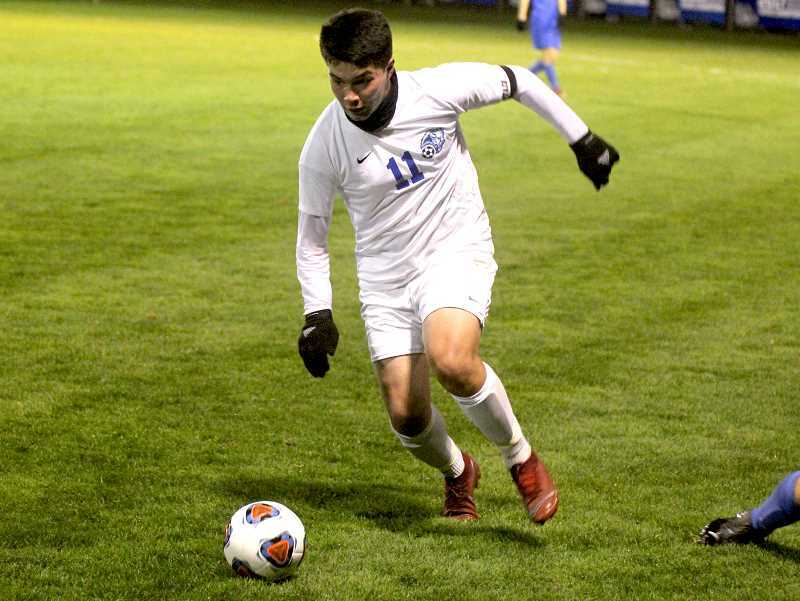 The White Buffalos defense was able to keep Woodburn from scoring for a while with a combination of blocks from Madras goalie Byron Patt and a few shots of target for the Bulldogs. Woodburn was able to score again at the 12 minute mark in the first half. A lead pass to a sprinting Rodolfo Campuzano broke through the Madras defense. One-one-one with Patt, Campuzano kicked the ball in the top right corner of the goal for a score. Around six minutes left in the first half, Tyriek Rodriguez was able to get a shot of for the Buffs, but the kick was too high. The White Buffalos were down 2-0 to the Woodburn Bulldogs at halftime. The Bulldogs scored early in the second half. Edwin Silva received the ball on the left side of goal and took a high shot that went into the back of the net. A few minutes later, a free kick set up another goal for Woodburn. The free kick was passed high in the air and there was a scramble for possession between both teams. Woodburn was able to control the ball and Salvador Perez took a quick shot to the left side of the goal. The ball went in the goal and Woodburn took a 4-0 lead early in the second half. A corner kick set up the next Bulldog goal. The kick was deflected into the air and a Woodburn player kick the ball out of mid-air for a score. Around the halfway mark, Madras was called for a penalty inside the penalty area. This allowed Jairo Aguirre to take a free penalty kick for Woodburn. Aguirre took a low, fast kick and scored the sixth goal of the night for the Bulldogs. The Buffalos fought hard in the final 20 minutes, but were unable to score in the game. Madras was shut out for only the third time in the 2018 season and lost to Woodburn 6-0 in their Semifinals match. "As a whole, this has been a great year," head coach Clark Jones said. "It is the third semi-final team and comes home with a state trophy. We have nothing to be ashamed of, and have competed well throughout the year." "This team has learned to be resilient, and once we found out our style, played very competent, competitive, and controlling soccer," he said. "My favorite memory for the year was going into Molalla in 3rd-place and coming home in first. That was quite a bus ride!"